The Flutter Dunk is Yoshi's Special Shot in Mario Hoops 3-on-3. To perform it, the player must tap out the letter M twice. Yoshi initiates the shot by dribbling in an M-shape, which coats the ball with water. If the shot was executed from inside the 3-point line, Yoshi will Flutter Jump into the air, with a rainbow trailing behind him. He will then forcefully dunk the ball in the hoop and a rainbow-colored ring will appear. 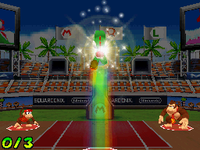 If executed from outside the 3-point line, Yoshi shoots the ball, with the rainbow trail behind it, towards the hoop. When a teammate dunks it in the hoop, the rainbow ring appears. The sound it makes is from Yoshi's flying sound in Super Mario World. This page was last edited on April 4, 2019, at 06:45.